Ambilight colour technology improvements on their way for IFA in September, while Smart TV usage stats look solid for Philips. Hot off the heels of the launch of the new Designline TV back in January at CES, Philips has revealed that we can expect an update to its Amblight TV range at IFA later this year. Speaking at the IFA Global Press Conference, TP Vision CEO Martins de Vries hinted that we're set to see more innovations in the area of Ambilight - the technology that projects ambient colour around your TV to enhance the viewing experience. "We will come with some new concepts at the IFA timeframe, so more on Ambilight," said De Vries. 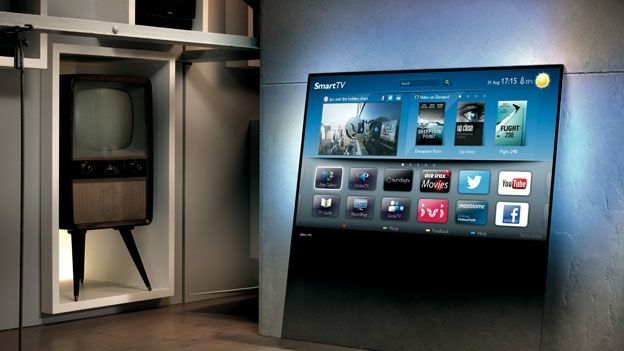 He also talked up the growth of Smart TV usage across the Philips range, revealing that 76 per cent of Philips Smart TV users interact with apps on their TV sets more than 25 times a month. He highlighted services like BBC iPlayer as the main driving force with 43 per cent of app usage coming from catch-up TV. Movie rentals were also a central focus with a film being rented more than once every minute on a Philips TV. In addition to it's Ambilight and Smart TV platform innovations, Philips are also pushing their Wi-Fi Miracast that lets you mirror your conent on a second screen and multi-room viewing via wi-Fi streaming direct to another TV or mobile device.